Cannes '12, Day Four: Bootleggers, transsexuals and falsely accused pedophiles, oh my! One of the dangers of gorging yourself on four or five films per day is festival fatigue, by which I don’t mean physical exhaustion (though that happens too) but rather a certain involuntary weariness in the face of so much exacting, challenging, or otherwise “difficult” art cinema. Toss me something popcorn-ready in this context and I’m liable to overreact, out of sheer gratitude for having been conventionally entertained. Leastways, that’s my excuse for being higher than a lot of other folks here on Lawless, a thoroughly familiar—but flavorful and rousing—shoot-’em-up set among Prohibition bootleggers. Written by Nick Cave and directed by John Hillcoat, it’s nearly as brutal as their previous collaboration, The Proposition, and claims to be inspired by the true exploits of three brothers, played here by Shia LaBeouf, Tom Hardy and Jason Clarke. 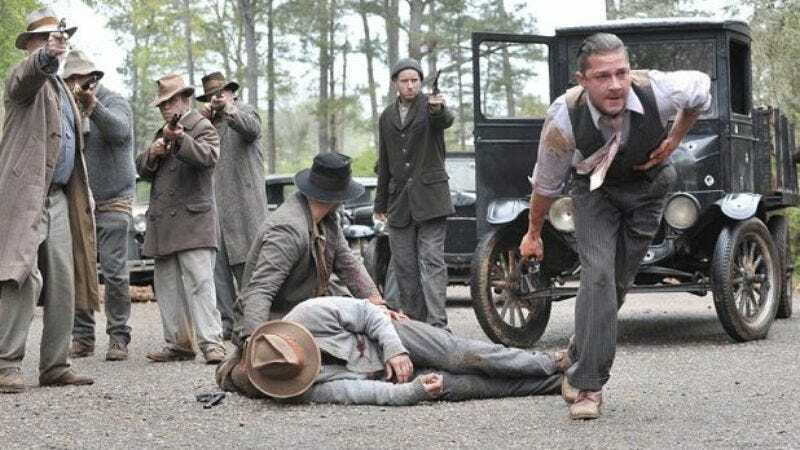 If you’ve seen even a handful of Tommy-gun movies, however, everything that happens here will feel preordained, right down to the sniveling local sheriff who’s helpless in the face of both our criminal anti-heroes and the psychopathic lawman in from Chicago. Needless to say, the Hollywood respite was short-lived (though there’s more to come in days ahead). Yesterday’s other Competition title, The Hunt, reverted to punishing, singleminded form… though it looks deceptively charming at the outset, as a kindergarten teacher played by Mads Mikkelsen (the villain in Casino Royale) graciously, expertly deflects the harmless crush of one little girl, the daughter of his best friend (Thomas Bo Larsen). Very small children don’t always understand the import of what they say, however, and a moment of passing anger at having a gift returned inspires this adorable moppet to inadvertently accuse Mikkelsen of sexual abuse. Her tentative attempts to retract the statement (“I said something silly, he didn’t do anything”) fall on predictably deaf ears, and Mikkelsen instantly becomes the town pariah, cold-cocked while shopping at the local market and ducking rocks thrown through his windows at home. Furthermore, when the school’s parents are given a list of possible abuse symptoms (nightmares, erratic behavior, etc. ), other kids start remembering having been touched inappropriately. Tomorrow: The best film I’ve seen here so far—a surprising departure from a controversial director. And possibly the second best as well, given that I’m heading now to the new Abbas Kiarostami picture.